Must be nice being Swervyn Mervyn. Nice to be so secure in your job that you can reject any idea of checks and balances on your all-but-supreme power. Nice that ex-Chancellors of the Exchequer view you as some Sun King beyond any check. 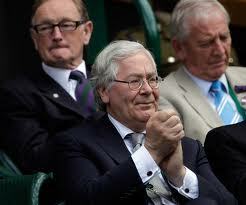 Nice to have a £400,000 salary and plenty of time to enjoy Wimbledon in the middle of an economic crisis. But does Merv the Swerv actually know what he’s doing? Let’s see. His job, his main one, is to make sure that inflation is at 2%, give or take 1%. Inflation has recently fallen to 4.2%, having been 4.8%. That’s a lot more than 2%. And it’s also not the real inflation rate. The new headline stat they like to throw at you is CPI – the Consumer Price Index – which ignored mortgage interest payments. But mortgages need to be paid. You can exclude anything you like from a price index, but that doesn’t make it a sober record of changing values. And if you look at the RPI – Retail Price Index – you find that inflation is a stunning 4.8%, down from an even worse 5.2%. What’s more, this awful record is no blip: it’s been running this way for years. What’s more, these terrible statistics ignore strong suspicions that the official index vastly understates the inflation which most ordinary people face in their lives. A study by the Resolution Foundation suggested that, over the decade to 2010, the cost of essentials soared by some 43% – way more than the 27% reported in the official stats. A recent study for the Mail found that the elderly faced inflation rates of 10% or more – rates that they simply have to pay if they want to heat their homes and put food on the table. Electricity prices are up on average around 17%. Meantime, speculation is growing that Swervyn Mervyn is keen to indulge in yet another round of Quantitative Easing – a polite way to say printing money. And what does printing money do? It creates inflation. That’s what happened in Weimar Germany, what happened in Zimbabwe. What always happens everywhere, when the printing presses create too much currency. Inflation won’t bother the Sun King. If you’ve got a nice job and don’t have to worry about food, fuel and transport prices, maybe it won’t bother you. But it bothers ordinary people a lot. They’re hurting now and will hurt much worse if the country sees more QE. The Sun King should stick to tennis. Inflation fighting is clearly not his game.